Why would anyone want to move to P4? 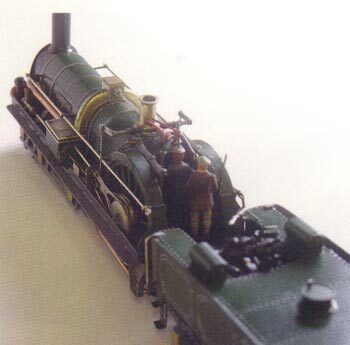 Active modellers in 4mm scale who currently use OO or EM standards may feel some questions need answers. A group of active modellers in P4 has produced this guide with the aim of providing an introduction to the world of P4 and some guidance as to how to begin modelling to P4. Our approach in writing this guide is to give straightforward practical information on what is involved in modelling in P4, to debunk, we hope, some of the myths, and to give realistic advice on some difficulties you might encounter and on the constraints which exist. P4 is a set of wheel and track standards to 4mm scale that replicates the prototype as closely as possible, within the limits of manufacturing tolerances. Similar standards have been established and are in use in other scales, for example P87 for 3.5mm (HO) and Scaleseven in 7mm. As with other wheel and track standards, there is no need to measure dimensions to a fraction of a millimetre. Key dimensions are set by gauges which are readily available for the UK Standard Gauge. Other track gauges are also catered for, some by specialist societies, including the Irish Broad Gauge and even Brunel's 7' 0¼" gauge! Wheel profiles and the critical back-to back dimension are taken care of by those specialist manufacturers working to the defined P4 standards, although, as with any pre-assembled wheelsets, it is good practice to check the back-to-back dimension with an appropriate gauge before installing them in your vehicle. What are the advantages of P4? The use of P4 standards makes it possible for locomotives and rolling stock to be built with few compromises and potentially to look right from all angles. By using scale width wheels, you can use the correct track gauge for your chosen prototype while maintaining the correct proportions of the superstructure. Apart from the visual improvement achieved by the use of scale flanges, the finer wheel profile used in P4 enables point and crossing work to be built with close to scale flangeways which provides - as on the prototype - near continuous support to the wheelsets through the crossing. This results in trackwork which is not only an accurate model in its own right, but can give improved, and more reliable, running through these track formations. Can I buy ready-to-lay track in P4? Plain track can be obtained in ready-to-lay form, or as pre-formed track bases which only require the rail to be threaded in place. Point and crossing work will, however, have to be hand-built, although recent developments in P4 modelling have effectively reduced the work involved to the equivalent of assembling a plastic kit. Later in this supplement, the section on trackwork gives more information on this aspect of layout construction. Is compensation essential in P4? 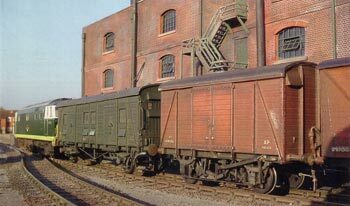 It is a myth that all rolling stock in P4 must have compensated or sprung suspension. 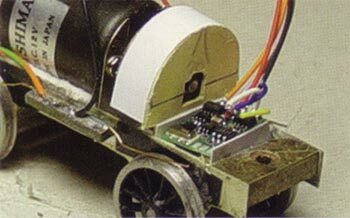 A rigid chassis will work in P4, if your track is laid accurately and your baseboards are rigid and stable. What compensation, or springing, will do is reduce the effect of inaccuracies in the construction of rolling stock and track, and it will ensure that all the wheels being utilised for current collection remain in contact with the track at all times. Intermittent contact is often the cause of poor running and the source of dirt on the rail head. In the sections covering rolling stock we give some idea of what is involved in the use of compensated and sprung suspension systems and how you can adopt a 'keep it simple' approach when you begin. Do I need a large space for a P4 Layout? 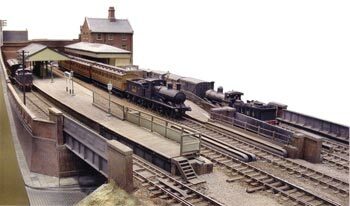 Unless you are in the fortunate position of having enough space to accommodate main lines with sweeping curves, then any 4mm scale layout will involve compromise to a greater or lesser degree. The constraints set by needing slightly larger curves or longer turnouts for P4 may affect what you can achieve in a given space, but these requirements themselves make for a more realistic appearance. But, if the overall accuracy of the layout is important to you, then moving to P4 is well worth considering. The width between the frames of this P4 tender enables a Lenz Gold Mini decoder to be installed transversely with ease. Mike Sharman builds his exquisite locomotives to P4 standards, citing as crucial the additional space obtainable with P4 between the driving wheels. Next Page: Why should I model in P4?